Vertical videos are moving image sequences recorded and/or rendered in what is conventionally called a “portrait” orientation, meaning that the image height is larger than its width. It is a format that is becoming increasingly common thanks to the use of smartphones and tablets as video apparatus. Made to be more comfortably held upright, these contemporary caméra-stylos favour the recording of standing images. A number of vertical videos found on the Internet is uploaded straight from them, without going through any further editing. Nonetheless, while the production of vertical videos becomes naturalized by the ergonomy of mobile devices, it also faces a loud opposition within digital platforms. As easy as it is to stumble upon a vertical video nowadays, one can find discourses committed to disapproving the format altogether. The vertical moving image is not simply considered “ugly,” in terms of a bad aesthetic decision, but actually “wrong,” as the result of operational mistakes that should not be allowed to happen. Framed as a syndrome, it is not only their artistic legitimacy that is put into question, but also their very possibility. This resistance can be more clearly understood if one consider how the format breaks with the medial paradigms that were consolidated throughout the last century, according to which movies should comply with a standard horizontal frame. By merely existing, a vertical video challenges the neutrality of such unspoken rule, making us wonder whether it really is an essential aspect of audiovisual media. In that sense, the agonistic discourse networks that are built around the topic operate in order to preserve traditional image configurations, rather than simply detracting a novel one. 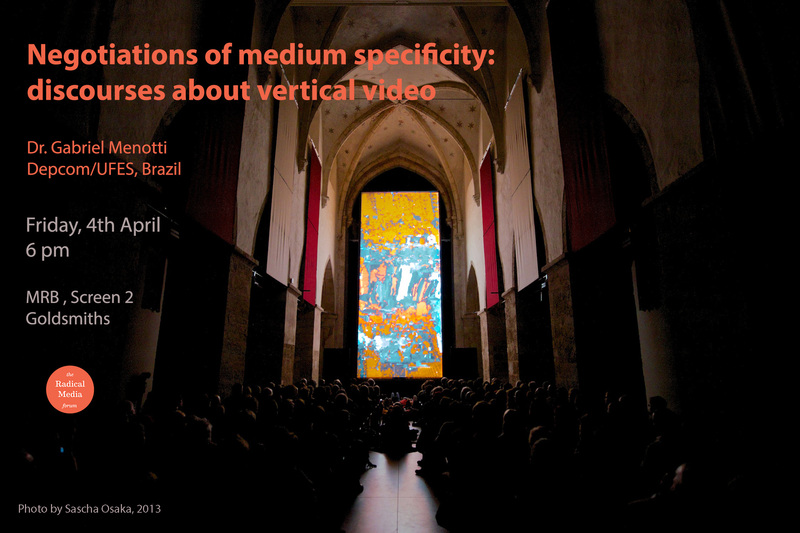 With the intention to understand how the definition of medium specificities is negotiated by the means of different structures within audiovisual circuits, this presentation means to trace some of the sociotechnical instances where the possibility of vertical videos is either constructed or suppressed. We shall see how the anomalous format is mocked in sarcastic public service announcements, uphold by filmmaking manifestos, programmed out of mobile applications, curated in art festivals and – more importantly – made actual in the movies themselves. Gabriel Menotti is a lecturer in Multimedia at the Federal University of Espírito Santo (Brazil). He holds a PhD in Media & Communications from Goldsmiths, University of London. He is the author of Através da Sala Escura (Intermeios, 2012), a history of movie theatres from the perspective of audiovisual performances.